Plan C is the only item we haven’t seen from Xûr 3+ times (unlike the rest)! We have a full review for this weapon. This fusion rifle also made our Top 5 Fusion Rifles list! It makes a wonderful secondary for critical moments, especially if you love using fusion rifles. The gun is balanced and has great stats overall when compared to other Fusion Rifles, and has the highest reload speed. But is it worth your Exotic slot? This weapon’s only real perk that sets it apart from other fusion rifles is it’s very quick charge time, which will only activate when you switch to it, and has a cooldown. You can quickly whip it out and get off a devastating shot that can swing a firefight to your favor. It works well even when using it as a primary since it holds five rounds in the magazine. There’s also a decent amount of options for upgrading its stability or range/accuracy so you can customize the weapon to your playstyle a little more. It’s definitely a balanced weapon overall. 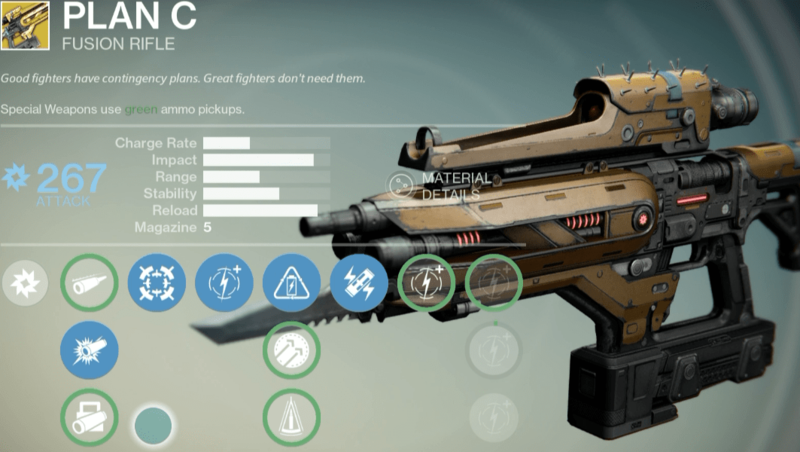 Right now Fusion Rifles are very powerful in the Crucible, and this is one no exception. It’s worth picking up, so if you enjoy using Fusion Rifles, buy this! You’ll want to maximize your range, so go with Field Choke and Hammer Forged. Plan C – Charge and equip times are very short immediately after weapon swap. This week it comes with a decent stat roll of 130 Discipline. Crest of Alpha Lupi, the other Exotic Titan chest, is similar in that it doesn’t provide any subclass specific upgrades – so feel free to use this on both subclasses! 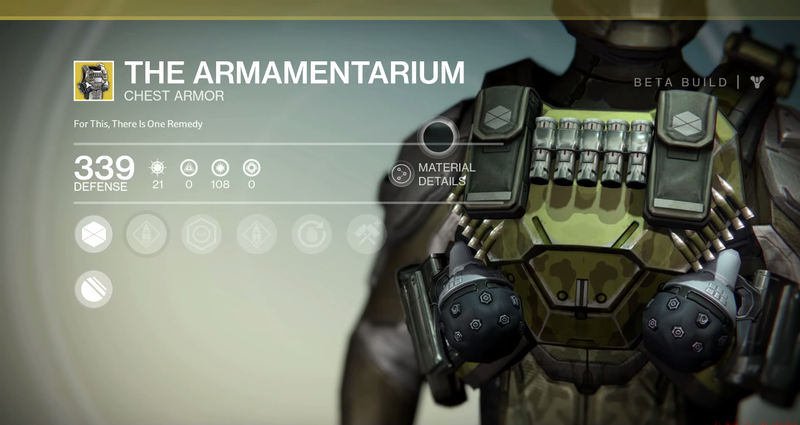 The Crest of Alpha Lupi is 1 of two Exotic Hunter chest pieces. The perks for this chest aren’t great, but for people who use their special weapon a lot (such as Plan C) and/or hand cannons, it’s going to be very useful indeed. The increased revival speed is significant and great for PvE or 3v3. If you are a team player in PvP, this is the chest piece for you. Helping you revive people faster could swing 3v3 matches in your favor, and more special weapon and hand cannon ammo will obviously come in handy if you use those regularly. This chest has 128 Strength, which isn’t as high as the last time it was sold, but it’s not too bad. Unless you’d rather wait for the Lucky Raspberry, an Exotic Helm (for level 30), or don’t think the perks would benefit your playstyle, buy it. If you do not play 3v3 PvP, or mostly stick to PvE, wait for an Exotic helm to help you get closer to level 30. The Warlocks currently have 2 Exotic chest options, and Voidfang Vestments is great for Voidwalkers who PvP a lot. The Dark Below will introduce the Starfire Protocol (see: expansion content). You probably already have this… seeing how it’s been sold even more than Sunbreakers at this point! It’s only got 124 Strength, but that is higher than what it’s been in the past. Along with spawning with full grenade energy, the Strength stat will reduce your melee cooldown time, making it an all around great choice. As with the Crest of Alpha Lupi, this is a better choice for PvP than PvE. If you don’t do much PvP, the Skull of Dire Ahamkara or Light Beyond Nemesis will be a better option (if Xûr cooperates).